Use your HERO camera to capture smooth, sweeping footage with the GoPro Karma Grip. Combining the 3-axis motorized gimbal stabilizer found in the Karma drone with a handgrip, the Karma Grip actively isolates the HERO camera from vibrations that occur while walking, running, or even standing still. 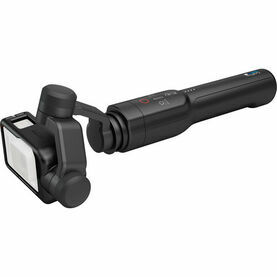 Accessory compatibility means that you can also stabilize vehicle or body-mounted shots as well. Simply clip your camera in, and you're ready to roll. Simple camera controls are available on the handle itself.